When I first saw Artoo on screen back in 1977, even my Father – an engineer whose trade had been repairing MBTs, APCs and other military tech – was puzzled as to how the little droid could pack in all the servos, radio gear, lights, and hydraulics to both trundle around on three wheels and ‘act up’ in ways which made him seem more human than machine. Nothing was said in the film program, and back then Dad always wanted to be first out at the end of a movie to avoid the crush. Hence we were on our feet the instant he sensed the score reaching its climax… So we all missed Kenny Baker’s name on the credits. It was obvious to the technical crew working from McQuarries sketches and the desires of Lucas to have the diminutive Astromech Droid as a key part of the cast that this called for more than technology alone could deliver. In the end, and after much head scratching, John Stears, who was the SFX supervisor on A New Hope, simply concluded that only an actor would do. Stears was not the first down this path, of course, for he remembered with great relish watching the 1972 Doug Trumbull directed Silent Running, which featured three drones, each of which was operated by an actor who was a bilateral amputee, without legs in each case. 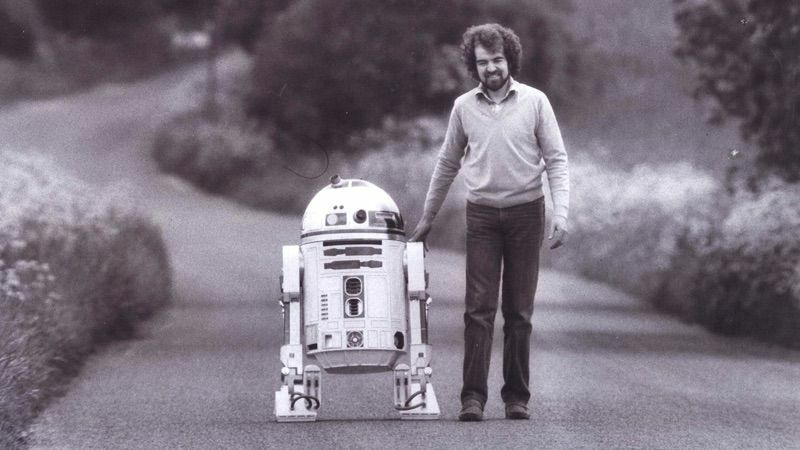 Thus, when the production team came to the conclusion that only an actor could give the required emotional content to R2-D2, he contacted a number of agents in the UK, seeking an actor of the appropriate stature to fit into the R2-D2 costume. The past is another country, and younger folks reading this might find it odd to them that in the ’60s and ’70s there was something of a ‘boom’ in little people in entertainment, which is how Kenny himself got his start in the industry: as part of a touring variety group composed entirely of diminutive actors. George Lucas himself flew into London to help with the search, and came to realize why there was so much resistance from the community of smaller actors. Both he and Stears had assumed it was owing to the weight and dangers which went with moving the heavy suit. However, it soon became clear that there was another issue as well, going back again to Silent Running. The actors who had portrayed the drones had, in later years, not received the credit they deserved for their feats in the film, and this was in Kenny’s mind when he tested Artoo for the first time. Not only did he not like the fit, but the thought of his face being masked the whole time did not appeal. He said himself he turned down the role three times before giving in, there being, as he once said, increasingly few little people in the industry at the time, as the sort of show he liked doing – cabaret and vaudeville – was falling out of favor. In addition, once he got to the stage he recognized that some of his fellow cast members had similar problems, but in the opposite direction, in that both Dave Prowse and Peter Mayhew (Darth Vader and Chewbacca) had similarly difficult times with casting, as there were few roles for actors of their stature in film as well. Add to that all of them would be behind masks, and voiced by other people gave, it seems Kenny something of a sense of camaraderie with the great unknowns of Star Wars. And, of course there was respect. Carrie, Harrison, and Mark especially took to the veteran, as they had done with Alec Guinness, and soaked up Kenny’s exploits as he and Alec chatted about ‘the business’ with their eager co-stars. Though Ralph Mcquarrie and John Stears were the main conceptual forces behind R2-D2, they were not the people who finished the job for the screen. This honor fell to film technician Tony Dyson. Tony’s White Horse Toy Company was brought in to complete a number of units for the production of Star Wars. Six were various RC versions, with different levels of detail and functionality, and two were specially designed for the use of Kenny Baker, featuring tubes, down which the actor could put his legs, into Artoo’s feet. Tony’s Workshop at The White Horse. Note the little saddle here, for use in idle mode. This helps take pressure off the main legs when standing only on the main legs (this is a heavy toy). Note also the various indentations in the base which prevent Artoos from sliding off to The Maker alone knows what fate. And slide he does… The rollers and bearings on the feet of Artoo are very smooth and free running, allowing him to swivel on the spot if needed, in all modes. In addition, the center roller is held in place in the body with a very secure tension snap/spring. Very sturdy and showing no sign of compression when in travel mode. Here are the two tubes which convert the rolling RC Artoo into the standing Kenny Baker suit. And, should you feel the need, there is even a restraining bolt for your obstroclious little Astro Droid. To prevent damage to the paintwork, on opening the body panels, this tool has been very handy. Small though, and easily lost. On each side of his body Artoo has his main tools deployable: the data input as seen above, and the grappling arm on the left, as well as a few other minor panel ports. All well done with slide-and-pivot joints so they can open full, but sit flush when closed. The head is the only part which is not diecast in detail, I suppose as it houses all the electronics (though I am still not so sure). It would have been nice to have had a metal head, but the painting and weathering on Artoo’s dome is right on the money. Fitting Kenny’s legs. It is nice to see this as it recognizes a grand performer and a most kind gentleman. All complete… A worthy addition to the Chogokin range. He’s not a cheap toy for sure, but these days that can be said of any Chogokin model. However, I cannot regret this addition, and have relegated my other 1/6 scale Artoo to the guest room collection, as this lad stands now with the heroes. I do wish Bandai had offered even a limited re-release of Threepio to go with him, as I said before. Either way, if you are wavering, don’t. Flaws like the dome and the oversized rivet holes are trivial compared to what this toy gets right, and puts it streets ahead of every other version. Gunpla TV – Episode 237 – MS Option Set 9 & MG Providence Gundam!